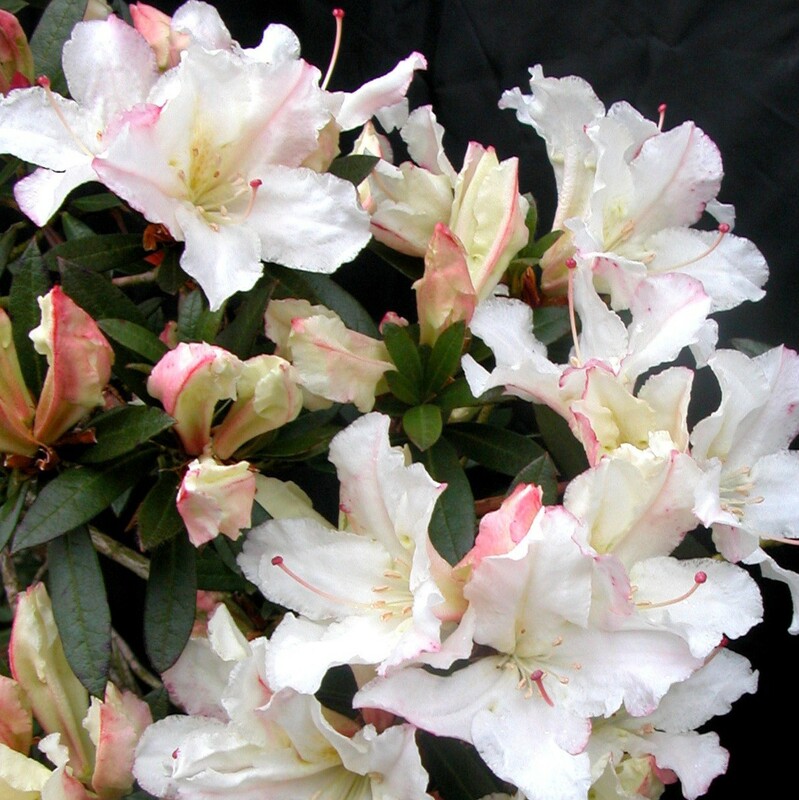 Glendoick carries Europe's largest range of these fabulous plants. 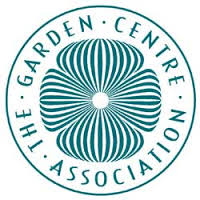 This large group of species and their hybrids provide superb garden plants for relatively mild gardens and for cool greenhouse and conservatory. Milder winters mean more of us can grow these plants outdoors and they are drought-tolerant once established. Cold winters may cut them back but they often break away from the base. Many are sweetly scented (marked *) . 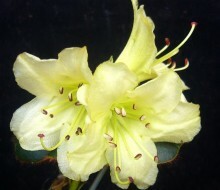 The hardiest such as R. edgeworthii, R. ciliatum, R. lindleyi etc can be grown out of doors in a sheltered site at Glendoick. Most are epiphytic so they need a coarse growing medium and sharp drainage: they do well in raised beds, old tree-stumps or mossy logs in wet areas. In pots allow them to become a little pot-bound and keep drish in winter. They can be hard pruned after flowering to improve habit. CARNEUM H2 Med EM-M Pale pink, lightly scented. Rarely offered. CHANGII H4 Low EM-M Yellow flowers in March-April. New introduction, one of the hardiest Maddenia, surviving recent hard winters outdoors. Oval dark green leaves. CILIATUM H3-4 Semi-Dwf EM Pale pink, light scent. One of the hardiest Maddenia species. Good at Glendoick. 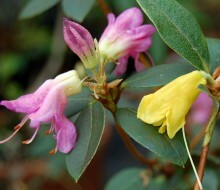 CRENULATUM H3 Low M Cream flushed yellow or pale pink. Amazing new species from Vietnam/Laos with small leaves. Useful late flowering dwarf. DALHOUSIAE var. RHABDOTUM H2 Med L Cream, with crimson stripes down the lobes, late. One of the latest flowering Maddenia. Peeling bark. A show-stopper. EXCELLENS H2-3 Med L * Large scented white. Large leaves. Useful for late flowering. FLETCHERIANUM 'Yellow Bunting' H3-4 Semi-Dwf E Pale yellow. Requires good drainage. Hardy outdoors in E. Scotland. FORMOSUM INAEQUALE C.& H. 301. H2 1.5m. EM-M * Large white flowers with a yellow blotch in April-May. Very strong scent. Usually grown indoors. FORMOSUM 'SHILLONG' ITEOPHYLLUM Gp. C.& H. 302 H3 Low ML-L * Scented white, flushed pink in bud. We grow this outside on a wall at Glendoick. 'KHASIA' C.& H. 320 H2 * Low M white with prominent yellow blotch, good scent. A lovely plant for a cool house. JOHNSTONEANUM H3 Med M Slightly fragrant creamy-yellow. The hardiest of the larger Maddenias, good outdoors at Glendoick. LEPTOCLADON H2-3 Low E Very freely produced greenish-yellow. 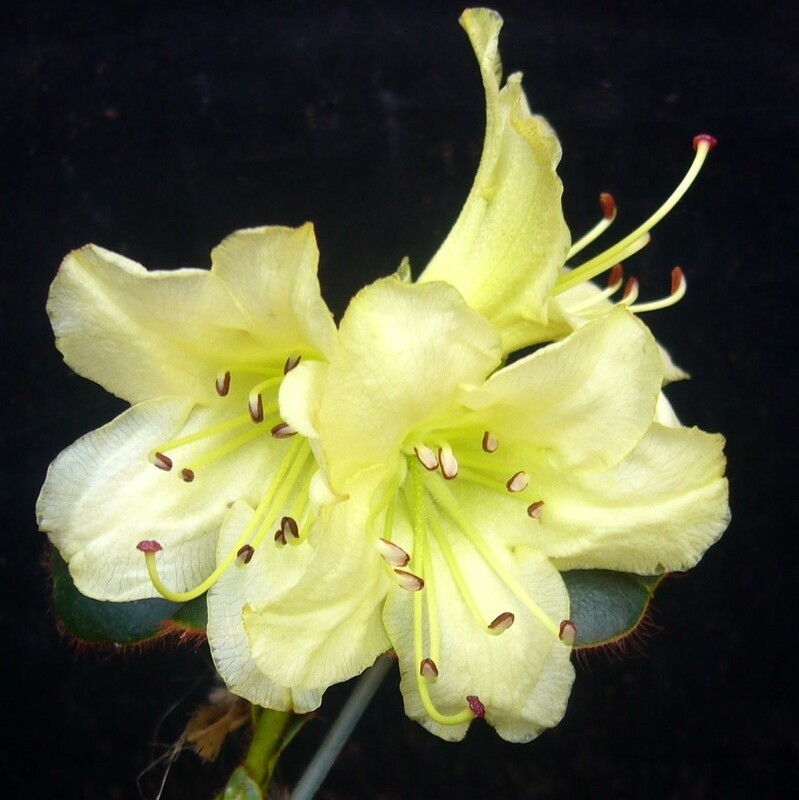 A new species from Vietnam for greenhouse or mild garden. Proving relatively hardy outdoors at Glendoick, an outstanding introduction. LILIIFLORUM H3-4 Med L * Scented white, late. 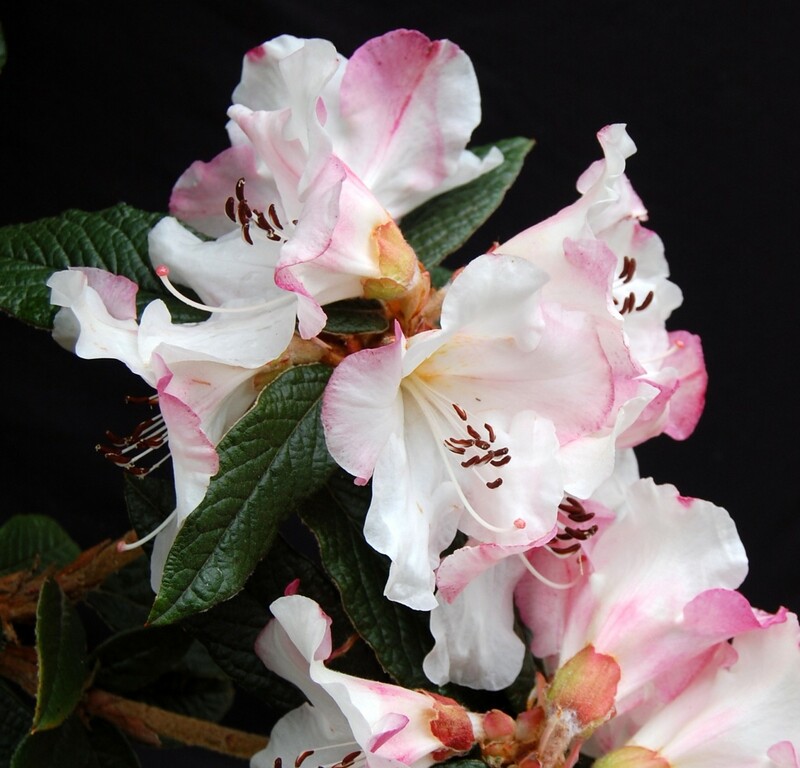 Proving hardy outdoors at Glendoick, and useful for its late flowering in June. LINDLEYI L.& S. (grothausii) H2-3 Med M * Outstanding, large white lily-like fls. Worth attempting out of doors in many parts of Britain: hardy outdoors at Glendoick, except in severest winters. Rangy habit. Good drainage required. ‘GEORDIE SHERRIFF’ form with good pink flushing. MADDENII POLYANDRUM Gp. 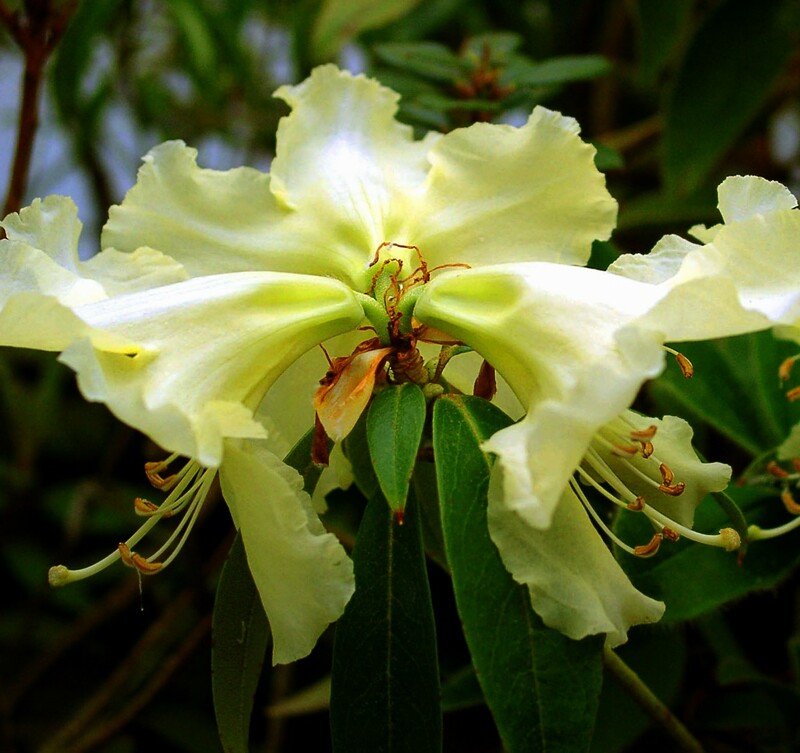 Yellow-cream (Gigha) H2 Med ML * Large-flowered scented pale yellow-cream. The best form we have seen. For mildest gardens or indoors. MADDENII ssp. CRASSUM H2-3 2m. L * Strongly scented white flowers. Grows well at Glendoick. Best in some shade. 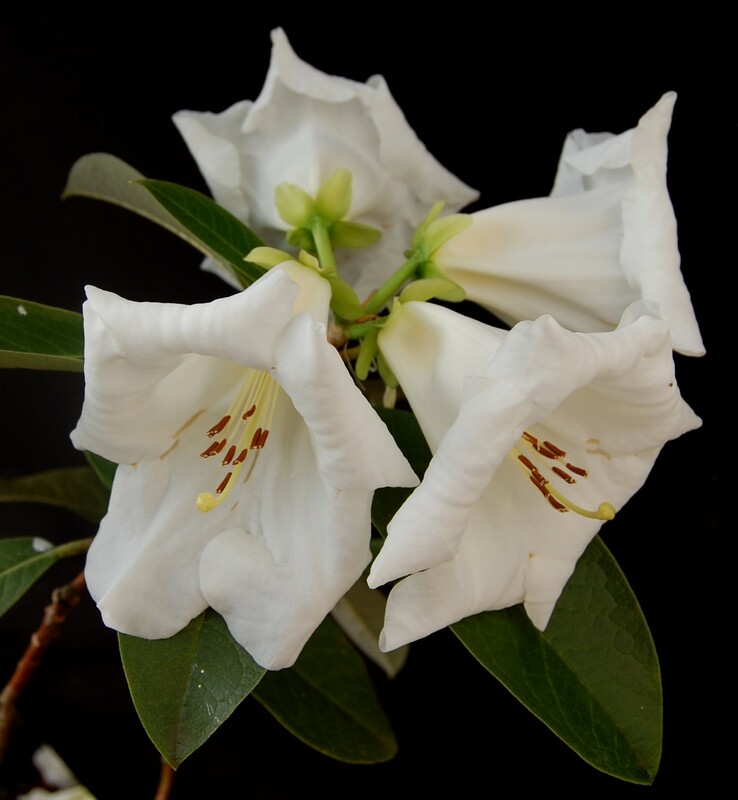 SCOPULORUM CC 7571 SELECT H2 Med EM * Pretty, fragrant white flowers with a yellow blotch in April-May. Free-flowering. Small leaves and good habit. The first reintroduction and the best form we have seen. VALENTINIANUM H2-3 Dwarf EM Deep yellow, early. Dark hairy leaves. Perfect for growing on an old tree stump, growing well at Glendoick. VALENTINIODES (VALENTINIANUM VAR. OBLONGILOBATUM) C.&H. 7186 H3-4 Low L Deep yellow, late Very different from R. valentinianum and much larger in all parts. Now described as a new species. Roundish hairy leaves. From S.E. Yunnan. VEITCHIANUM 'DOI INTHANON' KC 9001 select H1-2 Med EM-M * Huge sweetly-scented white fls in early April. Vigorous upright habit. Kenneth Cox intro. Needs sharp drainage. 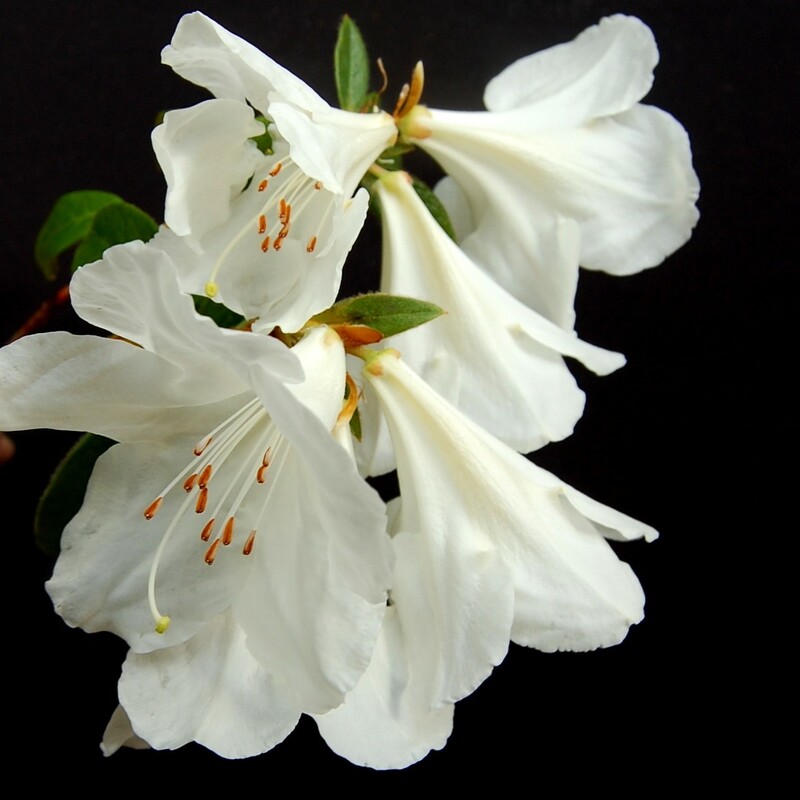 WUMINGENSE CGG 14050 NEW H2-3 Semi-Dwf Pure white flowers in pairs. Dwarf, compact. The first introduction. Newly introduced from Guangxi. ELSE FRYE H2-3 Med EM * Sweetly scented pale pink-white, throat yellow. Curiously this scents the air of a room very well, but the flowers seem only lightly fragrant. Fairly compact. 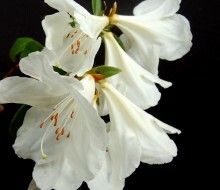 FRAGRANTISSIMUM H2 Med M * Large scented white fls. Suitable outdoors in mild gardens. Excellent in a pot with long shoots trained around stakes. Very straggily and now superceded by better behaved hybrids. JIM RUSSELL (CILIICALYX HYBRID) H1-2 Tall E * Large frilly light pink-white scented fls in huge trusses. One of the most spectacular Maddenia hybrids. 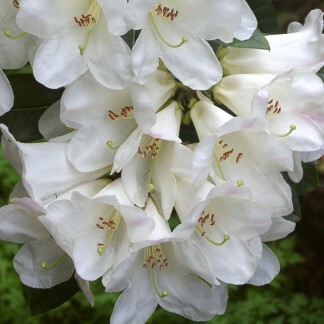 LADY ALICE FITZWILLIAM H2-3 Low EM-M * Scented white fls. Similar to 'Fragrantissimum' but more compact. 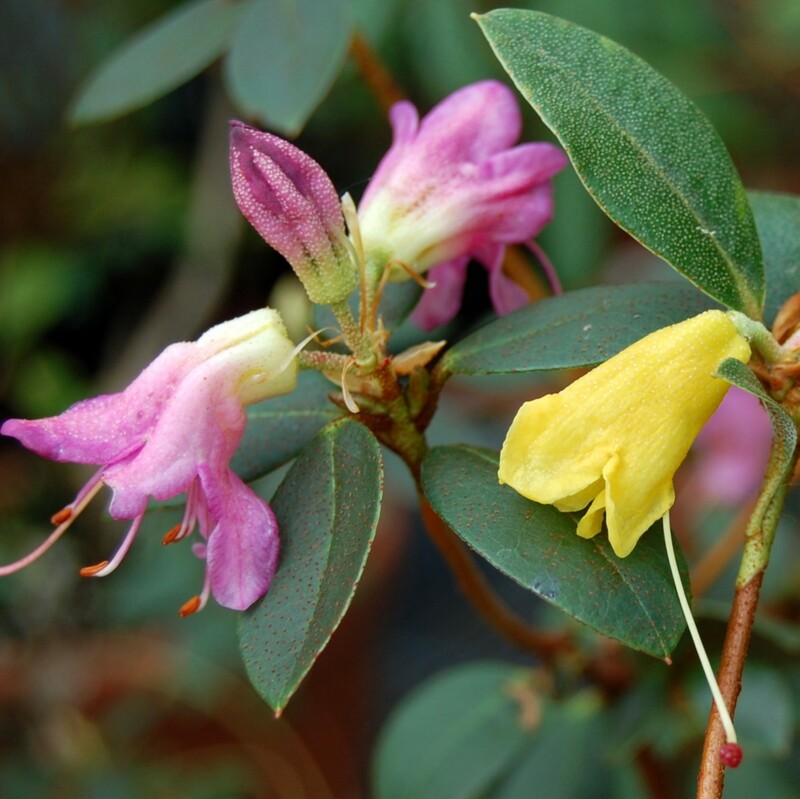 Hardy outdoors on a sheltered wall at Glendoick & good in a greenhouse or conservatory. MI AMOR H1-2 Med M * Enormous scented white flowers like giant lillies One of the mosy spectacular of all Maddenia hybrids, for indoors or mildest gardens. TURNSTONE (edgeworthii x moupinense) H3 Semi-Dwf E * White flushed pink, scented, early. Compact habit, drought tolerant. Flowers well outdoors at Glendoick. PINK pale pink flowers. H2-3. Smaller than the Maddenia species with charming white or yellow flowers. Usually epiphytes, so require good drainage. Most are hardy in a sheltered site at Glendoick. DEKATANUM H(3-)4 Low E Strong clear yellow, early. Introduced by Ludlow and Sherriff. Fine peeling bark. Good on a sheltered wall at Glendoick. LEUCASPIS H2-3 Semi-Dwf EM $ Lovely flat-faced white fls with black anthers. Hairy leaves. Needs very good drainage and a sheltered site. MEGERATUM H3 Dwarf E Dark little hairy shiny leaves. Needs excellent drainage. Best in a raised bed. H2-4. Hairy leaf under-surface and white or yellow flowers. Epiphytes which need perfect drainage in a raised, partly shaded bed, on a very steep bank, or on rocks or mossy logs in wet areas. 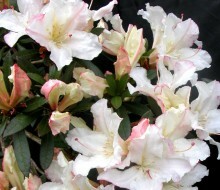 EDGEWORTHII H2-3 M $ * Large white flushed pink flowers in May. 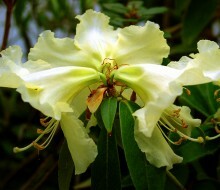 A very popular scented species which proves hardy at Glendoick in a raised bed. Most attractive dark, rugose foliage with indumentum. One of our favourites. Several forms offered. SEINGHKUENSE H2-3 Semi-dwf E $ Flat yellow fls, small indumented leaves. Makes a fine container plant. Can be grown outdoors in milder & west coast gardens. CAMELLIIFLORUM H3-4 Med L Small camellia-like flowers white, pink or crimson, late. Quite hardy if given perfect drainage. Epiphytic. This subsection contains the only autumn-flowering non-Vireya species. they have considerable potential as parents of autumn or/and repeat-flowering hybrids. Sharp drainage essential. CONCINNOIDES H2-3? Low VVL Pinkish-purple in Autumn. First introduction by Kenneth Cox. Needs sharp drainage. KASOENSE HECC 10009 NEW H2-3 Low VVL Similar to but larger in all parts than R. monanthum with 3-5 flowers per truss. First ever introduction by Peter & Kenneth Cox. A fine Autumn flowering species for a mild site. MONANTHUM NEW H2-3 Low VVL 1-2 per truss tubular bright yellow flowers, flowering indoors from September to January. First Introduction. H2-3 Med-Tall EM-L These little-known species are fine garden plants for warm and sheltered gardens such as Cornwall and Argyll and have potential in mild parts of Spain, Portugal, Italy and France. They can form huge trees in time. CHIONASTRUM species CGG 14072 H3 1.5m. 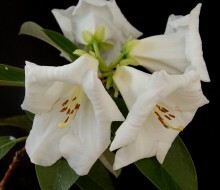 Glossy leaves and scented white or pink flowers in May-June. HONGKONGENSE (RBGE) H2 1-1.5m Mass of pretty white flowers. Pinkish purple young growth. Good indoors. LATOUCHIAE H2-3 2-3m+ Pink, spotted, scented. For mild climates or indoors. Very beautiful. Heat tolerant. MOULMAINENSE H1-2 pink or white, scented. VIALII H2-3 Low-Med EM Striking red fls. Newly introduced. This is the 'real' R. viallii. Should be excellent in Cornwall.